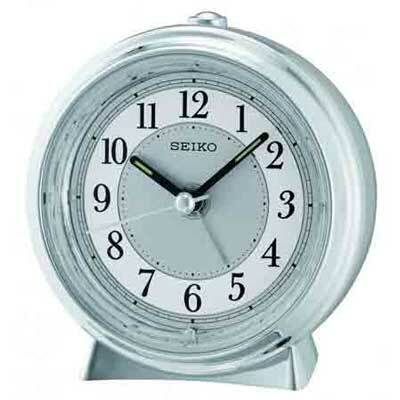 The Seiko QHE132SL Non-Ticking Alarm Clock has a chrome bezel and silver face that make this clock stand out. The white chapter ring with black Arabic numerals and the straight black hands with quiet sweep second hand make this clock easy to read. If you press the snooze button a single white led bulb will illuminate the face of the clock so you can tell time in the dark. Set over each of the numerals and in the hands is a small dot of Lumbrite that will glow for a short time after the lights go out. The beep alarm has a snooze button that will stop the alarm from going off for 5 minutes. You can press this button up to six times, on the seventh time the alarm cuts off. One "AA" battery included. Size: Height 4" X Width 3 3/4" x Depth 2"